Provide seamless access to files stored in SharePoint, Office 365, Dropbox, or other enterprise cloud repositories. Prevent unauthorized distribution of email attachments. Allow users to securely view, edit, and share content without compromising corporate data. Enforce data loss prevention (DLP) controls without requiring users to jump through security hoops. 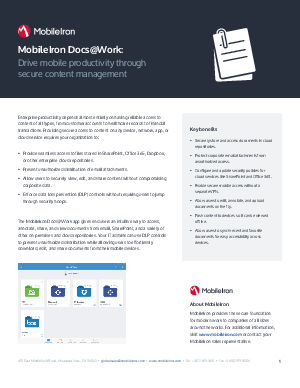 download, edit, and share documents from their mobile devices.